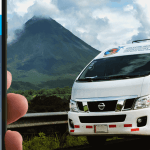 Tropical Tours Shuttles: from Santa Teresa to San Jose SJO Costa Rica International Airport we offer daily shared shuttle bus services and private minibus transportation. Price ranges to San Jose Airport starting at: $50 per person on shared shuttles departing at 06:45am and 02:45pm. $240 per trip for a private minibus. 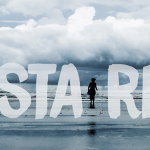 It’s a 5 hour ride from Santa Teresa beach in Puntarenas to SJO Terminal in Costa Rica. 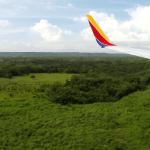 I book a transfer from Santa Teresa to SJO airport. They were on a time waiting for me next to my hotel gate. Trip was qucik and comfortable. One thing, that I didn’t expect that was they left us on a ferry and another guy pick us after it. Excellent! Clean, prompt and easy! Libo, our driver was very kind and professional. We were able to communicate just fine with I speaking very little Spanish and he speaking a little English. 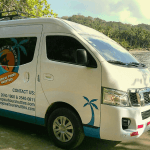 We communicated with Tropical Tours mostly via email and Whats App. They responded quickly to everything and were very accommodating! We asked for a 6am pick up for the 9am ferry and were there well ahead of time, but were first on and off, and made it to San Jose Airport with plenty of time for our 2:15 flight. We hired private transportation, so the van could fit many more, but we had just 4. It was clean and air conditioned and Libo drove so carefully and the roads were great! I would recommend Tropical Tours for sure! 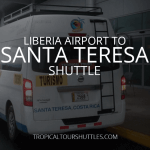 We used Tropical Tours Shuttle to take us from Santa Teresa to San Jose Airport. We got the private shuttle for our group of 5, and they were able to pick us up at 3:30 am to get us to the airport. They were professional, responsive, and helpful. Thank you! On time, good driving, friendly people. Had a great experience going from Santa Teresa back to SJO. We hired a private van for the 5 of us – reasonably priced. The driver picked us up exactly when we needed him to, and drove us to the ferry. He asked us to remain in the air-conditioned van while he bought our tickets. On the other side another driver waited. The previous driver told us that he would call and give our description to our new driver, so everything was easy. The second driver was beyond great. He pointed out things along the way, stopped when we needed him to, and was fun to talk to. 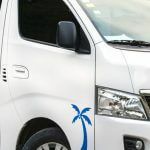 We will definitely use Tropical Tours Shuttles again. Super easy and on-time travel from Santa Teresa to San Jose. We took the 6:30 morning shuttle which picked us up on the main road near our airBnB. We arrived in Tambor at 8:00 where we got dropped off and waited for the 9:00 ferry to Puntarenas. The ferry was fun and lively. After getting off the ferry, we were quickly met by a new driver on the other side. The trip to San Jose from there was very safe and flew by. I would definitely do it this way again. Everything went as planned. Three women need transportation from Santa Teresa to San Jose airport. We ordered our own shuttle, it came on time, left us to the ferry and an another driver was wellcoming us on the other side. He drove us at the airport. Excellent service for Transfer between Santa Teresa and San Jose. Wifi in bus and v professional driver. 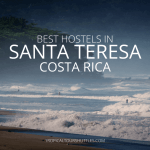 Departure place: at your location (hotel, hostel or house in Malpais Santa Teresa). 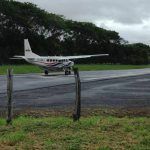 Our door to door minibus shuttle service will take you safe and directly from Santa Teresa beach, Costa Rica to San Jose International Airport SJO. 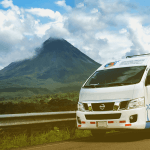 Costa Rica is a beautiful country, but the infrastructure is uncertain and our geography doesn’t help either, that’s why in some sections of the route you will have to go through bumpy and dusty roads on your way to San Jose city.